Map of the world showing the achievements of each country during the 2008 Summer Olympics in Beijing, People's Republic of China. Gold for countries achieving at least one gold medal. Silver for countries achieving at least one silver medal. Brown for countries achieving at least one bronze medal. Green for countries that did not win a medal. Black for countries that did not participate. A yellow square displays the host city (Beijing). Blue asterisks display countries achieving their first medal ever in a Summer Olympics. The 2008 Summer Olympics medal table is a list of National Olympic Committees (NOCs) ranked by the number of gold medals won by their athletes during the 2008 Summer Olympics, held in Beijing, the capital of the People's Republic of China, from 8 August to 24 August 2008. Approximately 11,028 athletes from 204 NOCs participated in 302 events in 28 sports. Athletes from 87 countries won medals, and 55 of them won at least one gold medal. Both of these categories set new records until surpassed in 2016. Athletes from China won the most gold medals, with 48 gold medals. Athletes from the United States won the most total medals, with 112. Afghanistan, Mauritius, Sudan, Tajikistan and Togo won their first Olympic medals. Athletes from Mongolia (which previously held the record for most medals without a gold) and Panama won their first gold medals. Serbian swimmer Milorad Čavić won the first medal for the country as an independent NOC. Serbian athletes have previously won medals as nationals of Yugoslavia and Serbia and Montenegro. Samoa won its first Olympic medal due to medals reallocation after the IOC retested doping samples in 2016. The ranking in this table is based on information provided by the International Olympic Committee (IOC) and is consistent with IOC convention in its published medal tables. By default, the table is ordered by the number of gold medals the athletes from a nation have won (in this context, a "nation" is an entity represented by a National Olympic Committee). The number of silver medals is taken into consideration next and then the number of bronze medals. If nations are still tied, equal ranking is given and they are listed alphabetically by IOC country code. In boxing, judo, taekwondo and wrestling, two bronze medals are awarded in each weight class. Therefore, the total number of bronze medals is greater than the total number of gold or silver medals. An exception was the men's 84 kg Greco-Roman wrestling, where Ara Abrahamian was stripped of his medal due to his conduct during the medal ceremony. Additionally there was a tie for the silver medal in the women's 100 metres in athletics and no bronze was awarded. Ties for third in swimming's men's 100 metre backstroke and men's 100 metre freestyle meant that two bronze medals were awarded for those events. From left to right: Ryan Lochte (bronze), Michael Phelps (gold), both from USA, and László Cseh from Hungary (silver) show off the medals they earned from the men's 400 metre individual medley. Ketleyn Quadros from Brazil won a bronze medal in women's 57 kg judo. Emma Snowsill (left) and Emma Moffatt (right) from Australia show off their gold and bronze medals after the women's triathlon. Belarusian athletes Vadim Devyatovskiy and Ivan Tsikhan, who won silver and bronze respectively in the men's hammer throw, both tested positive for abnormal levels of testosterone. After attending a disciplinary hearing in September 2008, they were stripped of their medals on 11 December 2008. Krisztián Pars of Hungary was awarded the silver medal, and Koji Murofushi of Japan was awarded the bronze. However, both of the Belarusian athletes subsequently had their medals reinstated because the doping tests were not handled correctly. Kim Jong-su (PRK) DSQ −1 −1 On 15 August 2008, the IOC announced that North Korean shooter Kim Jong-su had tested positive for the banned substance propranolol and he was stripped of his two medals. He had won a bronze medal in the 10 metre air pistol and silver in the 50 metre pistol. After the disqualification, the bronze medal in the 10 metre air pistol went to Jason Turner of the United States, the silver medal in the 50 metre pistol went to Tan Zongliang of China, and the bronze to Vladimir Isakov of Russia. Ara Abrahamian (SWE) DSQ −1 −1 Swedish wrestler Ara Abrahamian was originally awarded a bronze medal in the Greco-Roman 84 kg event. However, at the medal ceremony he walked off the podium and dropped his medal on the mat in protest against the judging in his event. On 16 August 2008, the IOC decided to strip Abrahamian of his medal because they felt it amounted to a political demonstration and was disrespectful to other athletes. As there was already one other bronze medalist in this event, Abrahamian's medal was not reallocated. Lyudmila Blonska (UKR) DSQ −1 −1 Ukrainian athlete Lyudmyla Blonska, who finished second in the women's heptathlon, tested positive for the steroid methyltestosterone. On 22 August 2008, the IOC officially stripped Blonska of her medal, and as a result, the silver medal went to Hyleas Fountain of the United States, and the bronze medal to Tatyana Chernova of Russia. 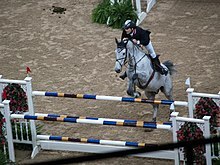 Tony Andre Hansen (NOR) DSQ −1 −1 Norwegian equestrian athlete Tony André Hansen's horse tested positive for the pain relieving medication capsaicin, a banned substance. 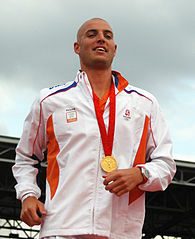 Hansen, who had won a bronze medal in the team jumping event, was disqualified. In the team jumping system, the top three scores garnered by the four riders are counted. Hansen had the best score on his team, and it was removed from the total. Without Hansen's score, his team was below the bronze medal threshold, and bronze was awarded to the team from Switzerland on 22 December 2008. Rashid Ramzi (BRN) DSQ −1 −1 On 18 November 2009, the IOC announced that two medalists had been stripped of their medals. First, Rashid Ramzi of Bahrain had been stripped of the gold medal in the men's 1500 m race. He had been the first athlete from Bahrain to win an Olympic gold medal. His frozen blood sample was retested and found to contain traces of Cera, a stamina-building blood-booster. Kenyan Asbel Kipruto Kiprop was upgraded to gold, Nicholas Willis of New Zealand was given the silver and Mehdi Baala of France received the bronze. Italian cyclist Davide Rebellin had also tested positive for Cera and was stripped of the silver medal he earned in the men's road race. Fabian Cancellara of Switzerland later had his bronze medal upgraded to silver, and the bronze medal was awarded to Alexandr Kolobnev of Russia. Andrei Mikhnevich (BLR) DSQ −1 −1 In 2012, the IAAF announced that retested doping samples of Belarusian shotputter Andrei Mikhnevich from the 2005 World Athletics Championships were found positive for three anabolic steroids: Clenbuterol, Metandienone and Oxandrolone. On 20 August 2014, the IOC disqualified Mikhnevich's results from the 2008 Summer Olympics in the men's shot put event and reallocated the bronze medal to Canadian Dylan Armstrong. Sibel Özkan (TUR) DSQ −1 −1 On 22 July 2016, Sibel Özkan of Turkey was disqualified due to an anti-doping rule violation and stripped of her silver medal in the women's 48 kg event. The IOC requested that the IWF modify the results of the weightlifting events, and the medals were reallocated accordingly. Yuliya Chermoshanskaya (RUS) DSQ −1 −1 On 16 August 2016, the Russian women's 4 × 100 metres relay team was disqualified for doping. The Russian team members were stripped of their gold Olympic medals, as Yuliya Chermoshanskaya had her samples reanalyzed and tested positive for two prohibited substances. The IOC requested that the IAAF modify the results, and the medals were redistributed accordingly. Tatyana Firova (RUS) DSQ −1 −1 On 19 August 2016, the Russian women's 4 × 400 metres relay team was disqualified for doping and stripped of their silver Olympic medals, when team member Anastasiya Kapachinskaya had her samples reanalyzed and tested positive for two prohibited substances. Another member of the Russian 4 × 400 metres relay team, Tatyana Firova, was separately disqualified on 31 August 2016. The Belarusian 4 × 400 metres relay team (4th place) was also disqualified due to a doping violation by Sviatlana Vusovich. Tigran Martirosyan (ARM) DSQ −1 −1 On 31 August 2016, the IOC disqualified six sportspersons for failing doping tests at the 2008 Games. They included Russian weightlifting medalists Nadezhda Evstyukhina (bronze medal in the women's 75 kg event) and Marina Shainova (silver medal in the women's 58 kg event). Also disqualified were bronze medal weightlifter Tigran Martirosyan of Armenia (men's 69 kg event) and fellow weightlifters Alexandru Dudoglo of Moldova (9th place in men's 69 kg event) and Intigam Zairov of Azerbaijan (9th place in men's 85 kg event). Yarelis Barrios (CUB) DSQ −1 −1 On 1 September 2016, the IOC disqualified a further two athletes. Cuban discus thrower Yarelys Barrios, who won a silver medal in the women's discus throw, was disqualified after testing positive for Acetazolamide and ordered to return her medal. Qatari sprinter Samuel Francis, who finished 16th in the men's 100 metres, was also disqualified after testing positive for Stanozolol. Mariya Abakumova (RUS) DSQ −1 −1 On 13 September 2016, four more Russian athletes were disqualified for doping offenses. Two of those were medalists from the 2008 Summer Olympics: silver medalist Mariya Abakumova in the women's javelin throw and Denis Alekseyev, who was in the bronze medal team for the men's 4 × 400 m relay. Inga Abitova, who finished 6th in the 10,000 metres, and cyclist Ekaterina Gnidenko also tested positive for a banned substance and were disqualified. The IOC requested that the IAAF modify the results; medals in the men's 4 × 400 m relay event were redistributed, and on 9 July 2017 Michael Bingham, Martyn Rooney, Andrew Steele and Robert Tobin received the bronze medals in London. In the women's javelin throw event, Christina Obergföll of Germany was advanced to silver, and the bronze medal was reallocated to Goldie Sayers of Great Britain. Anna Chicherova (RUS) DSQ −1 −1 On 6 October 2016, the IOC disqualified Anna Chicherova of the Russian Federation for testing positive for performance-enhancing drugs. 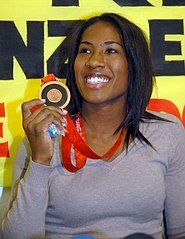 She had won a bronze medal in the women's high jump. Yelena Slesarenko of Russia (4th place) and Vita Palamar of Ukraine (5th place) were also disqualified. Andrei Rybakou (BLR) DSQ −1 −1 On 26 October 2016, the IOC disqualified nine more athletes for failing drugs tests at the 2008 games. Amongst them were six medalists: Andrei Rybakou and Nastassia Novikava, both from Belarus, Olha Korobka of Ukraine, Ekaterina Volkova of the Russian Federation, Soslan Tigiev of Uzbekistan, and Taimuraz Tigiyev of Kazakhstan. The IOC requested that UWW modify the results of the wrestling events, and the medals were reallocated accordingly. The IOC requested that the IWF modify the results of the weightlifting events, and the medals were reallocated accordingly. The IOC also requested that the IAAF modify the results of the women's 3000 metres steeplechase event, and the medals were reallocated accordingly. Denys Yurchenko (UKR) DSQ −1 −1 On 17 November 2016, the IOC disqualified sixteen more athletes for failing drugs tests at the 2008 games. Amongst them were ten medal winners: Khadzhimurat Akkayev, Khasan Baroyev and Dmitry Lapikov from the Russian Federation, Mariya Grabovetskaya, Asset Mambetov and Irina Nekrassova from Kazakhstan, Nataliya Davydova and Denys Yurchenko, both from Ukraine, Hrysopiyí Devetzí of Greece, and Vitaliy Rahimov of Azerbaijan. The IOC requested that UWW modify the results of the wrestling events, and the medals were reallocated accordingly. The IOC requested that the IWF modify the results of the weightlifting events, and the medals were reallocated accordingly. The IOC also requested that the IAAF modify the results, and medals in the men's pole vault event were redistributed accordingly. Aksana Miankova (BLR) DSQ −1 −1 On 25 November 2016, the IOC disqualified Aksana Miankova and Natallia Mikhnevich, both from Belarus, and Ilya Ilin from Kazakhstan. The IOC requested that the IWF modify the results of the weightlifting events, and the medals were reallocated accordingly. The IOC also requested that the IAAF modify the results, and medals in the women's hammer throw event were redistributed accordingly. Chen Xiexia (CHN) DSQ −1 −1 On 12 January 2017, the IOC disqualified Chen Xiexia, Liu Chunhong and Cao Lei, all from China, and Nadzeya Ostapchuk from Belarus. The IOC requested that the IWF modify the results of the weightlifting events, and the medals were reallocated accordingly. The IOC also requested that the IAAF modify the results, and medals in the women's shot put event were redistributed accordingly. Nesta Carter (JAM) DSQ −1 −1 On 25 January 2017, the Jamaican team were stripped of the gold medal place in the men's 4 × 100 m relay due to Nesta Carter testing positive for the prohibited substance methylhexaneamine. The IOC requested that the IAAF modify the results, and, after CAS dismisses the appeal of Jamaican sprinter, the medals were redistributed accordingly. Trinidad and Tobago team was advanced to gold, Japan to silver, and Brazil to bronze. Tatyana Lebedeva of Russia lost two silver medals in the women's long jump and triple jump events due to use of turinabol. The IOC requested that the IAAF modify the results, and, after CAS dismisses the appeal of Tatyana Lebedeva, the medals were redistributed accordingly. In the women's long jump event, Blessing Okagbare of Nigeria was advanced to silver, and Chelsea Hammond of Jamaica was advanced to bronze. In the women's triple jump event, Olga Rypakova of Kazakhstan was advanced to silver, and Yargelis Savigne of Cuba was advanced to bronze. Victoria Tereshchuk (UKR) DSQ −1 −1 On 1 March 2017, the IOC disqualified the Ukrainian athlete Victoria Tereshchuk after she tested positive for turinabol. She was stripped of the bronze medal in the women's modern pentathlon, which was reallocated to Anastasiya Samusevich of Belarus. Elvan Abeylegesse (TUR) DSQ −1 −1 On 29 March 2017, Elvan Abeylegesse was stripped of her two silver medals in the women's 5000 metres and 10000 metres, due to doping offences. The IOC requested that the IAAF modify the results of the events, and the medals were reallocated accordingly. Artur Taymazov (UZB) DSQ −1 −1 On 5 April 2017, the IOC disqualified the Uzbek wrestler Artur Taymazov, who won gold in the men's freestyle 120 kg event, due to use of turinabol and stanozolol. Ukrainian wrestler Vasyl Fedoryshyn was disqualified and stripped of his silver medal in the men's freestyle 60 kg event due to use of turinabol. The IOC requested that UWW modify the results of the wrestling events, and the medals were reallocated accordingly. Tatyana Chernova (RUS) DSQ −1 −1 On 24 April 2017, Tatyana Chernova of Russia was disqualified and stripped of the bronze medal in the women's heptathlon due to use of turinabol. 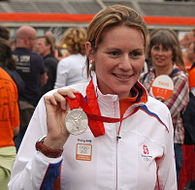 The bronze medal was reallocated to Kelly Sotherton of Great Britain. ^ "NOC entry forms received" (Press release). International Olympic Committee. 1 August 2008. Archived from the original on 8 August 2008. Retrieved 8 August 2008. (...) confirmed the qualification of 11,028 athletes, including 363 supplement athletes holding a P card. ^ "Afghans win first Olympic medal". BBC Sport. 20 August 2008. Archived from the original on 21 August 2008. Retrieved 20 August 2008. ^ "Mauritian delight at first ever medal". Times of India. 22 August 2008. Archived from the original on 27 August 2008. Retrieved 26 August 2008. ^ "Togo claims first Olympic medal". BBC News. 12 August 2008. Archived from the original on 13 August 2008. Retrieved 12 August 2008. ^ "Naidan wins Mongolia's first gold". BBC Sport. 14 August 2008. Archived from the original on 15 August 2008. Retrieved 14 August 2008. ^ "Serbian PM congratulates swimmer on winning medal in Beijing Olympics". www.news.cn (in Chinese). 17 August 2008. Archived from the original on 18 August 2008. Retrieved 18 August 2008. ^ "Beijing 2008". IOC. Archived from the original on 10 August 2008. Retrieved 10 August 2008. ^ Randy Harvey (17 August 2008). "Jamaicans 1-2-3 in women's 100". Los Angeles Times. Archived from the original on 18 August 2008. Retrieved 17 August 2008. ^ "GOLD: x2 for U.S." The Globe and Mail. 12 August 2008. Archived from the original on 17 August 2008. Retrieved 12 August 2008. Arkady Vyatchanin of Russia and Hayden Stoeckel of Australia tied for bronze. ^ The Canadian Press (11 December 2008). "Belarusian hammer throwers stripped of medals". The Sports Network. Archived from the original on 1 June 2009. Retrieved 5 June 2009. ^ "CAS reinstates Olympic medals for hammer throwers". United States Olympic Committee. 10 June 2010. Retrieved 21 September 2018. ^ "2 more athletes fail doping tests". CBC Sports. 15 August 2008. Archived from the original on 1 June 2009. Retrieved 5 June 2009. ^ Longman, Jeré (16 August 2008). "Swede Stripped of His Medal After His Angry Reaction". The New York Times. Retrieved 5 June 2009. ^ "Ukrainian Blonska stripped of silver medal in heptathlon". ESPN. Associated Press. 22 August 2008. Retrieved 5 June 2009. ^ The Canadian Press (22 December 2008). "Norwegian rider stripped of Olympic medal". The Sports Network. Archived from the original on 16 March 2009. Retrieved 5 June 2009. ^ a b "IOC sanctions five athletes who competed in Beijing". IOC. 18 November 2009. Retrieved 18 November 2009. ^ Young, Chris (19 November 2009). "Young: Olympians lose medals after retroactive doping test". Toronto Star. Archived from the original on 22 November 2009. Retrieved 19 November 2009. ^ "CAS rejects Davide Rebellin's appeal on doping positive in Beijing". velonation.com. VeloNation Press. 30 July 2010. Retrieved 2 June 2010. ^ "Cancellara receives silver medal from Beijing Olympic road race". Cyclingnews.com. 18 December 2010. Retrieved 19 December 2010. ^ Nadolny, Mark (20 August 2014). "Dylan Armstrong to be awarded Beijing 2008 shot put bronze". Canadian Olympic Committee. Retrieved 21 September 2018. ^ "IOC sanctions Turkish weightlifter for failing anti-doping test at Beijing 2008". IOC. 22 July 2016. Retrieved 21 December 2017. ^ a b c d e f "International Weightlifting Federation – Results by Events". IWF. Retrieved 16 February 2018. ^ "IOC sanctions Yulia Chermoshanskaya for failing anti-doping test at Beijing 2008". IOC. 16 August 2016. Retrieved 21 December 2017. ^ "The XXIX Olympic Games – Results – 4x100 metres relay women". IAAF. Retrieved 21 December 2017. ^ "Belated gold for Belgium at Van Damme Memorial". flandersnews.be. 10 September 2016. Retrieved 21 December 2017. ^ "IOC sanctions three athletes for failing anti-doping tests at Beijing 2008". IOC. 19 August 2016. Retrieved 21 December 2017. ^ a b "IOC sanctions six athletes for failing anti-doping tests at Beijing 2008". IOC. 31 August 2016. Retrieved 21 December 2017. ^ "The XXIX Olympic Games – Results – 4x400 metres relay women". IAAF. Retrieved 21 December 2017. ^ "IOC sanctions two athletes for failing anti-doping tests at Beijing 2008". IOC. 1 September 2016. Retrieved 21 December 2017. ^ "The XXIX Olympic Games – Results – Discus throw women". IAAF. Retrieved 21 December 2017. ^ "IOC sanctions four athletes for failing anti-doping tests at Beijing 2008 and London 2012". IOC. 13 September 2016. Retrieved 21 December 2017. ^ "The XXIX Olympic Games – Results – 4x400 metres relay men". IAAF. Retrieved 21 December 2017. ^ Harris, Rob (9 July 2017). "British Olympic relay team gets medals 9 years after race". The Denver Post. Retrieved 21 December 2017. ^ "IOC sanctions Anna Chicherova for failing anti-doping test at Beijing 2008". IOC. 6 October 2016. Retrieved 21 December 2017. ^ "The XXIX Olympic Games – Results – High jump women". IAAF. Retrieved 21 December 2017. ^ "IOC sanctions nine athletes for failing anti-doping test at Beijing 2008". IOC. 26 October 2016. Retrieved 27 October 2016. ^ a b c "IOC Sanctions Wrestlers for Anti-Doping Violations at Beijing 2008 and London 2012". United World Wrestling. Archived from the original on 28 December 2016. Retrieved 22 November 2016. ^ a b c "United World Wrestling DataBase". United World Wrestling. Retrieved 21 December 2017. ^ "The XXIX Olympic Games – Results – 3000 metres steeplechase women". IAAF. Retrieved 2 October 2017. ^ "IOC sanctions 16 athletes for failing anti-doping tests at Beijing 2008". IOC. 17 November 2016. ^ "The XXIX Olympic Games – Results – Pole vault men". IAAF. Retrieved 21 December 2017. ^ "IOC sanctions seven athletes for failing anti-doping tests at Beijing 2008 and London 2012". IOC. 25 November 2016. ^ "The XXIX Olympic Games – Results – Hammer throw women". IAAF. Retrieved 21 December 2017. ^ "IOC sanctions eight athletes for failing anti-doping test at Beijing 2008 and London 2012". IOC. 12 January 2017. ^ "The XXIX Olympic Games – Results – Shot put women". IAAF. Retrieved 21 December 2017. ^ a b "IOC sanctions two athletes for failing anti-doping test at Beijing 2008". IOC. 25 January 2017. ^ "Usain Bolt loses one Olympic gold medal as Nesta Carter tests positive". BBC Sport. 25 January 2017. ^ "Media Release 4984 Decision" (PDF). CAS. Retrieved 1 October 2018. ^ "The XXIX Olympic Games – Results – 4x100 metres relay men". IAAF. Retrieved 1 October 2018. ^ Ellingworth, James (25 January 2017). "Russia senator stripped of Olympic medals for doping". Associated Press. Retrieved 21 September 2018. ^ "Media Release 4803, 4804, 4983 Decision" (PDF). CAS. Retrieved 1 October 2018. ^ "The XXIX Olympic Games – Results – long jump women". IAAF. Retrieved 1 October 2018. ^ "The XXIX Olympic Games – Results – triple jump women". IAAF. Retrieved 1 October 2018. ^ "IOC sanctions one athlete for failing anti-doping test at Beijing 2008". IOC. 1 March 2017. Retrieved 21 December 2017. ^ bmallon. "2008-12 Olympic Doping Re-Test – an Update-Update". olympstats.com. Retrieved 21 December 2017. ^ Morgan, Liam (29 March 2017). "Turkish duo Bulut and Abeylegesse to officially be stripped of medals". insidethegames.biz. Retrieved 21 December 2017. ^ "NEWS 181 – IAAF March 2017 Newsletter". 29 March 2017. Retrieved 21 December 2017. ^ "The XXIX Olympic Games – Results – 5000 metres women". IAAF. Retrieved 16 February 2018. ^ "The XXIX Olympic Games – Results – 10,000 metres women". IAAF. Retrieved 29 October 2017. ^ "IOC sanctions three athletes for failing anti-doping test at Beijing 2008 and London 2012". IOC. 5 April 2017. Retrieved 21 December 2017. ^ "IOC sanctions two athletes for failing anti-doping test at Beijing 2008 and London 2012". IOC. 24 April 2017. Retrieved 21 December 2017. ^ "Kelly Sotherton says cloud has lifted after receiving Beijing bronze medal". BBC Sport. 13 September 2018. Retrieved 14 September 2018. Wikimedia Commons has media related to 2008 Summer Olympics medal winners.